The Garner sisters, juniors at the College of Coastal Georgia, do not plan to have the typical relaxing summer vacation. 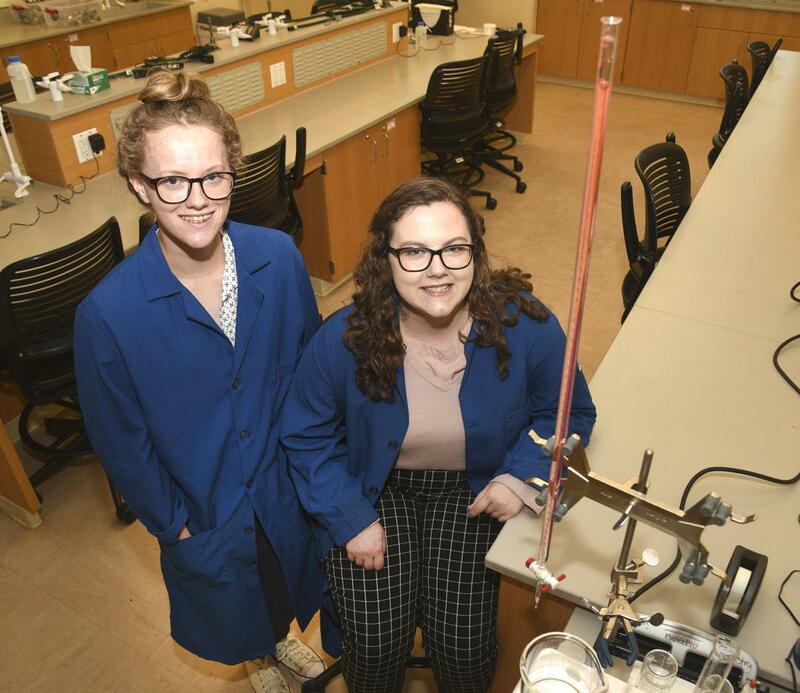 Rather than chill at the beach or pass their time with a summer job, Julia and Madeline Garner will be studying noise-induced stabilization of Hamiltonian systems and recording biosignatures in the moons of Jupiter and Saturn. Julia and Madeline Garner have been chosen for two separate Research Experiences for Undergraduates summer programs. REU is a highly competitive program offered by colleges and universities around the country to provide undergraduates with experience living and working like graduate students. Both sisters plan to pursue graduate school and hope that the REU experience will help prepare them for that next step in their academic careers. "I'm really hoping to kind of get a more focused idea of what I want to do in grad school and also have more experience in research and looking into all the different areas of mathematics," said Julia, a mathematics major. Madeline also plans to gain skills that can transfer into grad school. "I hope to be more confident in my researching skills and maybe presenting skills," said Madeline, a biochemistry major. Madeline Garner's REU will be hosted by the SETI Institute, a nonprofit private scientific research institution located in Silicon Valley in California. "It's an institute basically for looking at life on other planets and life in the universe," Madeline said. "They partner a lot with NASA AIM, and I got chosen to do research with Kathryn Bywaters, and her research is specialized in biosignatures found using nanopore technologies and DNA sequencing technologies to record biosignatures in the moons of Jupiter and Saturn." Julia Garner's REU is hosted by Valparaiso University in Indiana. She'll have a mentor in a project studying noise-induced stabilization of Hamiltonian systems. "They'll be looking at how noise can stabilize those systems, which are made up of Hamiltonian functions, and those functions basically describe the overall energy of a system," Julia explained. She'll be looking at a branch of unstable functions that can be stabilized with special kinds of noise. Madeline Garner, who works as a lab technician on campus, first learned about the REU opportunity through her boss, who told her that the program offered a wide array of research opportunities. Madeline passed the information along to her sister, who also learned about the program at a mathematics conference last fall. "There were several REU panels, and they talked about how useful that was for grad school and how interesting the work can be, and a lot of times the students would get published," Julia said. Madeline is interested in pursuing a career in molecular biology or genetics after graduate school. Julia hopes to attend a mathematics grad school program but is still working to decide what specific field she hopes to work in. Julia and Madeline came to Coastal Georgia from Cookeville, Tenn. Their brother also attends Coastal Georgia. They're triplets. "I really liked the small math department, and the faculty are really great," Julia said. "Also, the price and location are amazing as well. Who doesn't want to go to school by the beach, right?" Both said they feel like their experiences at Coastal Georgia so far have prepared them for the REU programs. "Being able to work as a lab technician gave me a lot of experience, and my boss really helped me out with the whole process," Madeline said. "And then, also being able to do independent research gave me some experience on my application that maybe other students might not have had." Julia also credited the attention she's received from the college's faculty. "I really like the math faculty," she said. "They're all really engaged, and since it's a small program, I always get to speak a lot with them, and I consider a lot of them mentors." Republished with the permission of The Brunswick News. Originally published at The Brunswick News.